Some of you know this. I used to be a fishmonger. Long summers smelling like last week’s haddock, a car interior smelling like last week’s cod baked in the summer sun all day, fish scales in the most random places you can imagine (or maybe best not to.) There was an upside to this, access to the very best of fresh fish. I still have a man on the inside and he never steers me wrong. So on a recent spin out to Howth I picked up some mussels. This is a recipe I love- 4 ingredients, sheer simplicity. I find the smokey flavour of the chorizo works really well with the sweetness of the mussels. Plus it’s nice to go for a tomato based sauce sometimes, mussels tend to be constantly subjected to wine, cream etc. Apologies about the photo not representing these delicious morsels as best it could. Manic dinner time, hungry people to feed- this food blogger chose survival over food-gawker. about 3 inches of chorizo. skin removed and cut into discs, then quarters. 3 large cloves of garlic. Crushed. Take the chorizo, peel the skin off, cut into smaller pieces so that after a brief fry they will crisp up and give off their delicious chorizo flavour! You don’t even have to add any oil as the chorizo will render down all by itself. Once they have crisped up, add the tin of tomatoes and the crushed cloves of garlic. Don’t be afraid to give this a good bit of hob time so that it reduces down. 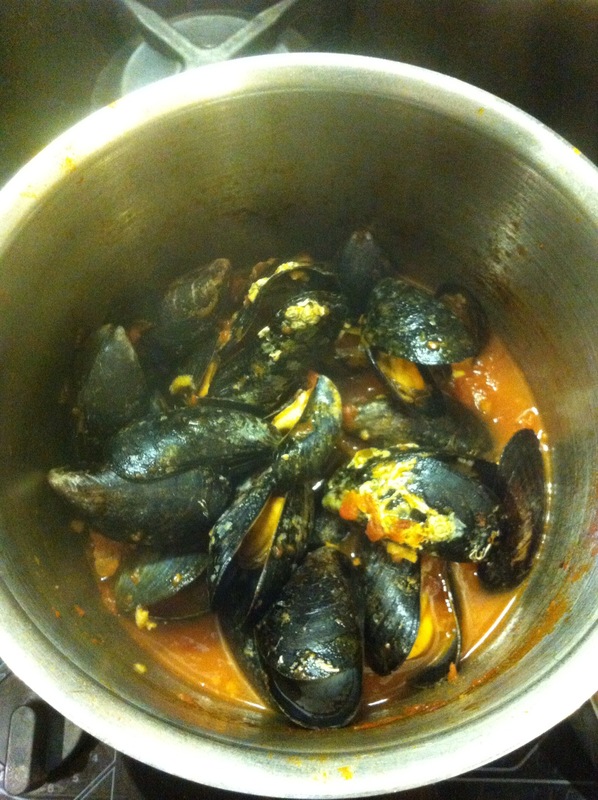 The juices/water in the mussels will thin out the sauce. As this bubbles away, clean your mussels. Take off their beards, and give the shells a good rub with your thumb to make sure anything loosely attached will come off. I do this under running cold water as it makes it a little easier. Any mussels that do not close after a good tap, bin them. Any ones that don’t open after cooking- bin them also. It’s just not worth it. Add the cleaned mussels to the sauce and put a lid on the pot. Turn up the heat and let them bath in the sauce until they open up wide. I stir them around once or twice as they open to make sure the sauce gets everywhere. P.S. Fiftieth blog post, time flies eh? Last week I asked for a few suggestions as to what my next recipe would be. Thanks to everyone for the comments and suggestions! Lizzy suggested something Moroccan or a fish dish- so I combined the two. And so was born my Sticky Moroccan Mackerel. Yesterday evening I made the short jaunt out to Howth and got my hands on some incredibly fresh whole mackerel, which my obliging fishmonger cleaned for me. I don’t mind cleaning fish, I used to do it for a living, but I appreciate when they offer to do it! For this recipe I took the barbecue out of hibernation, and it really added to the flavour of the dish. Fist wash the mackerel and pat dry with some kitchen paper. Take the heads off if you like. Then score the flesh as I have done in the photo- this allows the marinade to permeate into the flesh. This is important because the likelihood is if you barbecue the mackerel, a lot of the marinade will come off with the skin. Then mix all the ingredients until you get a smooth paste. 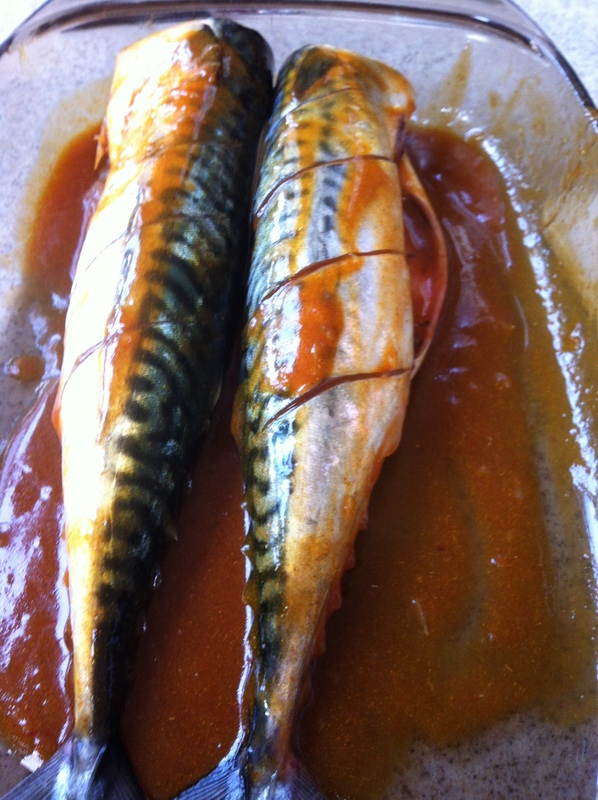 Place the mackerel in a long dish and spoon the marinade over them. Ensure the marinade gets into the cavity and then scores. Ideally if you can leave them to marinade for a few hours that would be perfect. If not, no worries! I didn’t have that long! Ensure you have a nice hot grill/ barbecue. The mackerel cooks pretty quickly. As sizes differ, as will the barbecue, the best guide re: timing I can give you would be to look into the scores on the skin and you can see how far the fillets on each side have cooked. If you have a fish grill this is ideal, as it allows you to turn the fish without it disintegrating. I served the mackerel with some greens and brown rice- on which I poured a little sesame oil and lime juice.